I decided to let the paint cure for a day on the firewall parts. With those parts waiting to be riveted it decided to move ahead and get some of the forward floor section work done. All the substructure got match drilled and deburred. There are several different areas on the floor that get flush rivets and others that don’t. There will also be areas that get riveted now to just the floor and substructure. Other areas will get riveted later with parts of the firewall and gear towers. I studied the plans for a good time making sure I knew just how the layout goes. I marked and dimpled the holes in the floor, making sure to only do the ones that the plans call for. I also marked all the #40 holes for the nutplates that needed to be machine countersunk for flush rivets by marking a CS next to them. After the floor was dimpled I marked all the corresponding holes in the 2 cross members so that I could countersink them to match the dimples. I then grabbed the pneumatic squeezer and dimpled all the required holes in the 4 floor ribs. It takes me a while to visualize the layout if the floor as they show it upside down in the plans since the substructure goes on the underside of the floor. I have to always recheck my work before I actually do it so that I don’t make any mistakes, which takes time! 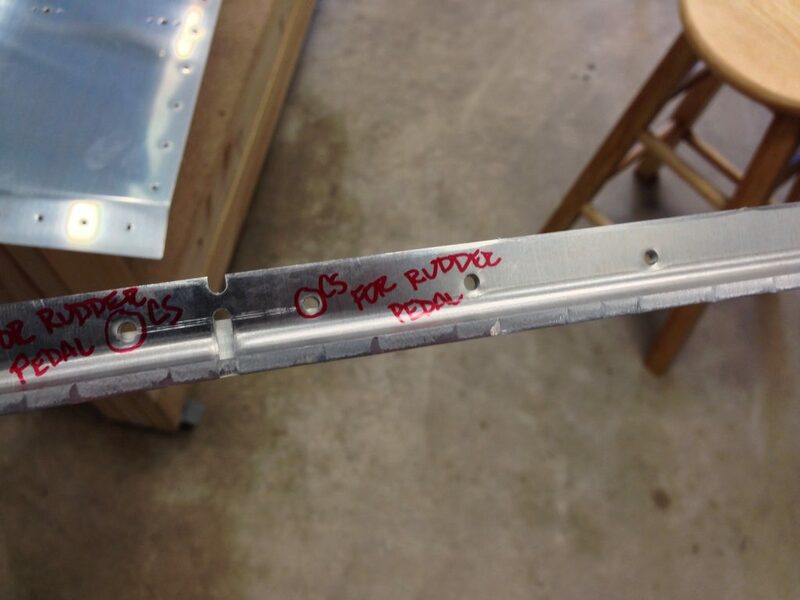 One option for the RV-8 is to have inflight adjustable rudder pedals or ground only adjustable ones. I chose the ground only for a couple of reasons, I didn’t like the looks of the inflight ones and I’m gonna be the only one flying it and won’t have to adjust them very often. As I was looking at the floor section planning my next move I noticed that there were not any rivet holes for the brackets that hold the rudder pedals in place. That got me to do some digging in the plans for how they will be installed. It turns out that the inflight adjustable ones are the standard and the ground ones are a build change. Not a big deal but as I was looking ahead in their plans I found that you would have to drill out a few rivets in different spots to go from universal rivets to flush ones to accommodate the new brackets for the pedals. So with a little planning now on parts that I will be working with on the firewall and gear towers I will save myself some work. Mainly I will just countersink the parts for flush rivets and not rivet those spots until I install the pedals. I makes the parts so that I will remember later. I now have all the forward floor parts done and ready for priming. I will let the primer dry overnight and will be able to rivet them as well as the firewall structure, if the paint feels cured enough for me.